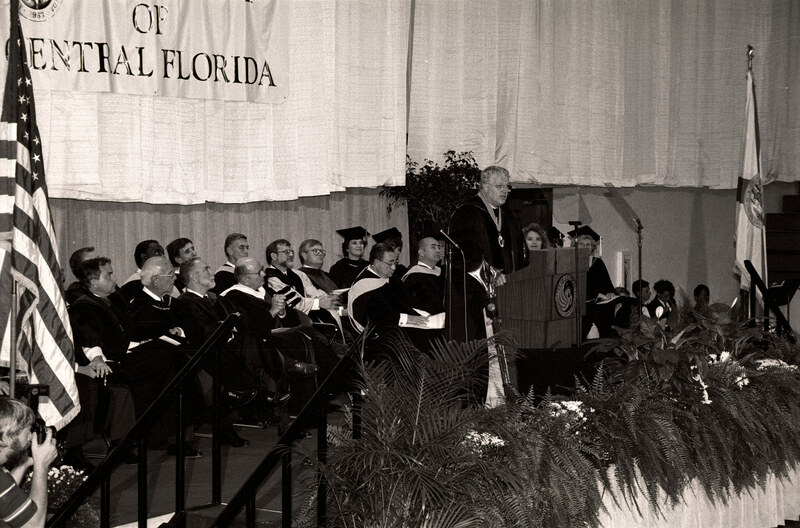 On November 19, 1992, UCF’s fourth president, John C. Hitt, delivered his inaugural address, “Vital Force, Vital Partner.” Here is his full speech. 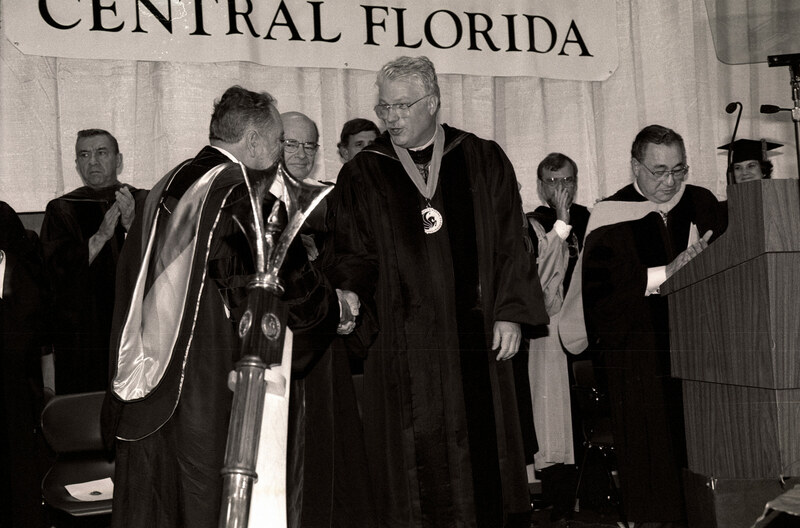 It seems hardly possible that I first visited UCF less than thirteen months ago, and that a year ago today I was between interviews in the search and selection process that culminated in my election as UCF’s fourth president on December 4, 1991. By then I had become convinced that the presidency of UCF offered just the challenge I wanted. That conviction burns even stronger today. 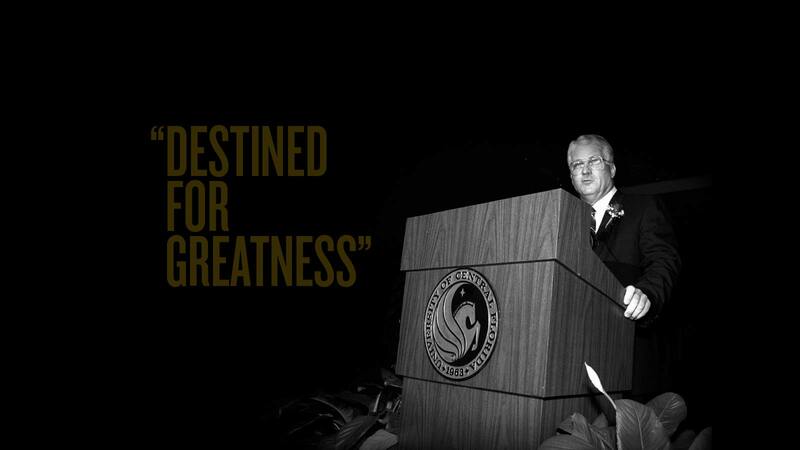 I am deeply honored to serve as UCF’s fourth president, and humbled by the trust it vests in me. I am both challenged and comforted by the knowledge that in all five of UCF’s Colleges: Arts and Sciences, Business Administration, Engineering, Education, and Health and Public Affairs, gifted and dedicated faculty and staff are working hard and well to help nearly 22,000 students reach the potential God placed within them. It is a continual wonder to see the multitude of ways in which our faculty and research staff apply the powers of their scholarship to discover new and exciting knowledge and to solve problems of significance for our state and nation. Whether it be in an art studio or a chemistry class, in an MBA class or a nursing lab, in an elementary school classroom or at the Florida Solar Energy Center, whether it is here in Orlando or at our Brevard or Daytona Beach campuses, UCF faculty, staff and students are striving to achieve their own personal and professional goals and to build a better future for Florida and its people. 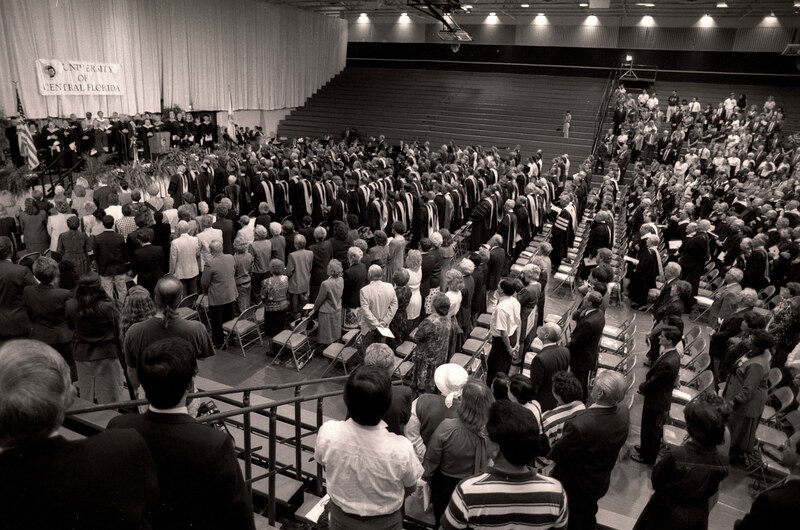 Often, the efforts of a single faculty member make an enormous difference. Consider the work of Dr. Harold Klee of our Department of Electrical and Computer Engineering. He responded to the request of Principal Robert Williams of Orlando’s Edgewater High School to establish “one or two” engineering courses for his seniors. Working together, they produced a magnet school program in engineering and math that serves Edgewater’s students superbly. Many of these students are members of minority groups who otherwise would have had little exposure to possible careers in engineering, math and science. In so many ways, UCF faculty are an invaluable resource to their communities. It is a special privilege to serve as president of a university. Society invests in universities not just its money, but something far more precious, the potential of enterprising men and women who seek to enrich their lives through higher education. Our country has led the world in its commitment to the dream that learning can raise the intellectual, cultural and material standards of living. First thought the Morrill Act, signed by Abraham Lincoln even as the Civil War raged, and later though the GI Bill and federal and state legislation providing financial assistance to pursue higher education, Americans have forged a bond of special trust with their colleges and universities. Here in Orlando, a group of 89 leading citizens risked at least $10,000 each to guarantee availability of the land on which we hold these ceremonies so that the State University serving Central Florida would be located in their community. They fervently believed that it was worth risking their personal treasure to assure that coming generations would have access to publicly assisted higher education in their city. Fortunately, the Legislature vindicated their faith by appropriating the funds to acquire the campus. The rest, as they say, is history. It is refreshing and endearing characteristic of Orlandoans that they think they can do just about anything. 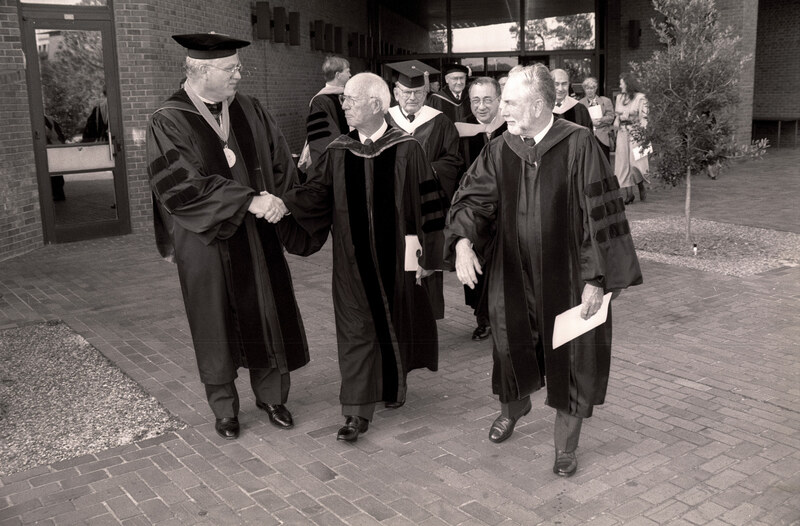 The dreams of greatness fostered by so many – Billy Dial, Senator Beth Johnson, Charlie Gray, Buell Duncan, Norm Glass, Bill Frederick, Joan Ruffier, Bill Schwartz, Representative Alzo Reddick, Linda Chapin and Glenda Hood to name only a few – have moved Orlando’s great university. Dreams of greatness are the stuff of the American experience. A university achieves true greatness through a combination of vision, planning, hard work, vital support and good luck. We have the good luck to be in Orlando, to have a truly dedicated, hard-working faculty and staff, talented students, devoted friends and alumni, and a long-standing commitment to excellence. We also have a proven capacity to dream and plan. Our plans spring from a vision of a modern metropolitan university serving the needs of the fastest growing city in the fastest growing region of Florida. We see UCF as a vital cultural and intellectual resource and as an indispensable force for economic development for all of Central Florida. We embrace the emerging ethos of metropolitan universities: we are committed to offering access to high-quality, affordable education grounded in the liberal arts; to providing the highly educated workforce a modern economy must have to flourish; to producing and transferring the scientific and technical knowledge necessary for creation and sustenance of well-paying jobs; and to developing a base of knowledge and expertise to assist with formulation of wise public policy. To be America’s leading partnership university. I am convinced that if UCF achieves these goals, it will be America’s leading metropolitan university, and, even more importantly, we will be a vital force in Central Florida’s development as the nation’s most dynamic, vibrant regional economy. The key to this success is found in the final goal: it is in our ability to form partnerships. In the highly competitive world of the ’90s and the 21st century, single institutions will not command the resources necessary to solve major problems. They must find common cause with individuals and other institutions of society and combine resources to address and resolve the pressing problems confronting our state, our nation and the world. Partnership is the key to achievement of UCF’s goals. Commitment to intensive, high-quality, undergraduate teaching is a staple at UCF. We intend to become national leaders in outcome-oriented teaching and learning. To accomplish this ambitious goal, we will need increased support from all sources: regents, legislators, private citizens, corporations and foundations. We will have to make creative and extensive use of emerging electronic information technologies, as well as the time-honored and tested techniques of live instruction. UCF is fortunate to have the Institute for Simulation and Training. If we use the expertise our colleagues in the Institute have lent to the armed services and to industrial clients, we can offer our students instructional opportunities of uncommon quality. We have been fortunate to attract support from key, high-tech companies. If they are willing to continue sharing their expertise and resources with our talented faculty and students, we will succeed. The focus on internationally prominent graduate study and research programs in key areas is important to UCF’s role as a stimulus to Central Florida’s economic development. The faith shown by the Regents and Legislature in establishing the Center for Research in Electro-Optics and Lasers has been vindicated as new lasers developed in the Center are immediately incorporated into products that support a competitive edge for high-tech companies here in Florida. Many of these companies employ holders of master’s and doctoral degrees awarded by UCF. There is abundant evidence that the presence of internationally prominent research and graduate programs in areas of economic significance stimulates economic growth. This was recognized in the cover story of the October 19, 1992 issue of Business Week, entitled “Hot Spots,” which highlighted fifteen places in the United States which are bucking the current business slump. Orlando was cited as “Laser Lane,” and UCF’s Center for Research in Electro-Optics and Lasers got specific mention as a key factor in its success. What are the ingredients in building new bases of vigorous, companies that can compete in world markets? Business Week says, “At the heart of each is often a major research university that acts as a magnet for big corporations and entrepreneurs. Business Week quotes Harvard political economist Robert B. Reich as saying that such centers represent “the future brand of economic development” in the U.S. Such partnerships between business, government, universities and venture capitalists are extremely congenial to Central Florida, and UCF looks forward to playing a key role in helping them form and propel our economy into the next century. We know that to be effective in this role, we must work closely with local business, industry and government, and we must listen carefully so that we can anticipate the needs of our developing economy. Providing an international focus to our curricula and research programs is a goal that needs little justification or explanation. We see evidence daily that we are living in an increasingly global economy. The free flow of trade and currencies is matched by a free flow of ideas and ideals. If UCF combines the burgeoning international trade and travel of Central Florida with the rich background of our own faculty, staff and students, we have the resources to accomplish some truly remarkable things. We have already seen development of a country-wide partnership with Poland. Who would have dreamed that UCF would be educating Polish city managers? We need to look to opportunities in Central and South America as well as Europe and the Pacific Rim. We will also need the cooperation and assistance of the rapidly expanding base of internationally oriented companies as well as the support of UCF’s many friends who are committed to international exchange as a medium of education. To fulfill our goal of becoming more inclusive and diverse will take real commitment on our part and the assistance of many local leaders and institutions. If we are to bring more women and members of minority groups to full participation in the life or our university, we need help in establishing role models, in demonstrating real opportunity, in making concrete the abstractions we preach. We need alliances with business and government and with minority communities. This year, minority enrollment grew by 10.9 percent at UCF: Hispanic enrollment led the way, increasing by 14.7 percent; and African-American enrollment increased by 9.3 percent. We are blessed to be in a community with a rich mix of cultures. We must capitalize on this asset to achieve the cultural diversity we need for a vibrant educational environment. Friends, UCF is an institution founded on partnership in a city that dares to dream. We are a university founded on the principles of access to high quality education at affordable cost, of research directed to public need, and of service to the people of our state, region and nation. I fervently believe that UCF will become America’s leading metropolitan university. With your help and support, we will move forward together — in partnership — to write the next chapter in the saga of a university destined for greatness.